Friends v Stevenage Town B.C. On Wednesday July 26th, the Friends from nine different counties, made their way to Stevenage Town B.C. to help celebrate their 75th Anniversary. 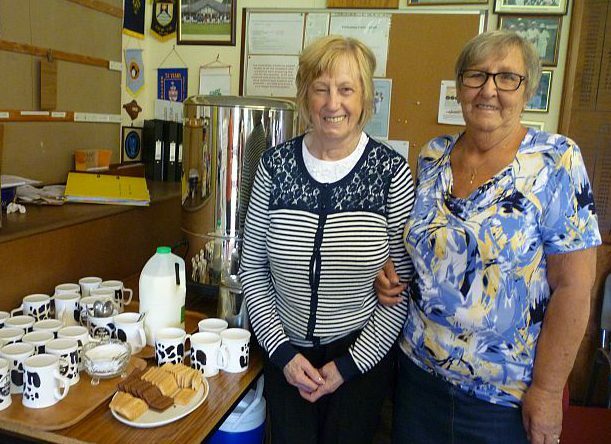 We were greeted by two lovely ladies, Nancy and Mabel, who kept us supplied with tea, coffee and biscuits throughout the day. From the first arrival at 11.30 until the end of the proceedings at 6.30. At 12.30 the buffet was declared open and the Friends filled their plates with quiche, salads, sandwiches and other delights. After lunch we made our way onto the green to be officially welcomed by the club President Terry Stout. 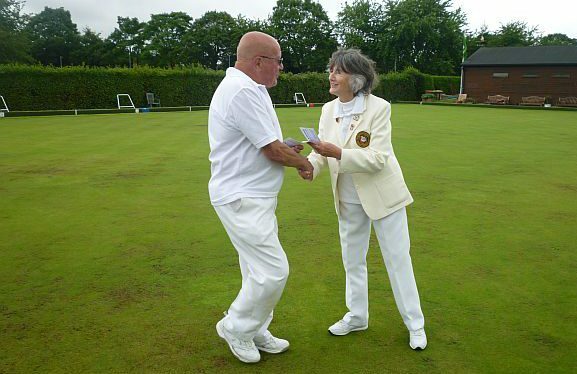 Captain Keith Greenough and Captain of the Day Cyndy Lee read out the teams and play commenced. Mike Cavill, who skipped the top rink, receiving the score card before the game. The weather forecast was pretty horrid and we took all the wet weather gear on to the green with us. Someone up there must like us because it was not too bad. A couple of light showers which did not affect the game and the fun. At ten ends it was a draw – but we played better in the second half and eventually won by 23 shots. Well done to all. The six rinks were very close and the final result could have gone either way. After the match we sat down to a magnificent four course meal prepared and served by the same ladies who provided the buffet. 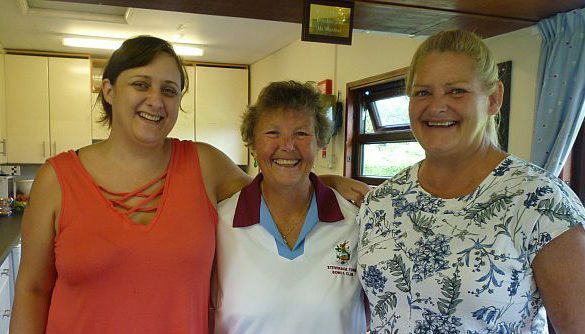 Ladies Captain Sue, her sister Vicky and daughter Leanne. After the meal President Terry thanked us for coming and invited us to come back next year. I hope we can as the Friends all had a fabulous time. Wonderful company, great food and good competitive bowling with lots of laughter all round. These days do not just happen. A lot of time and trouble goes into arranging these celebration matches and the Friends really do appreciate it. 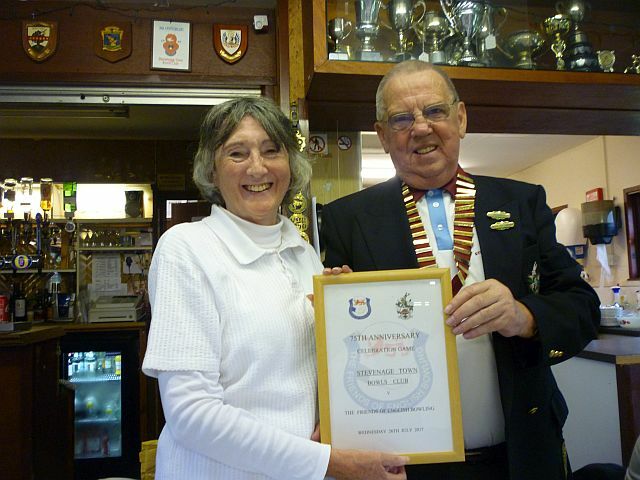 There was a lovely final surprise when Captain Keith handed a generous donation to swell the Friends coffers. Many thanks to Stevenage Town B.C. for this special day.